Who doesn’t love the awesome flavor of pumpkin? Whether you’re a pie fan or you love some toasted and seasoned pumpkin seeds, the pumpkin seems to be a celebrated fruit or vegetable (a pumpkin’s classification depends on who you ask and we won’t get into that matter right now) that everyone here in America and around the world loves. In fact, the iconic Pumpkin Spice Latte, or “PSL”, as the kids refer to it, may go down as a legendary pumpkin-flavored drink. While we’re all about pumpkins and pumpkin-flavored foods here at Bengtson’s Pumpkin Farm, there are some pumpkin-flavored products out on the market that…well, we’ll let you decide for yourself as to whether or not these actually sound appetizing. At the very least, we respect people’s passion for pumpkins, which is something that you’ll find at next year’s Homer Glen pumpkin patch. If you’re bummed out about missing this year’s local pumpkin fest, don’t worry because we have an awesome next year already in the works! For us, pumpkins are a year-round thing. Check out what people have had to say about the best pumpkin farm in Illinois here. And now, let’s get to the fun stuff! Though not available in the United States, these wafer crisp treats certainly come in some interesting flavors over in Japan. Japanese Kit Kats are traditionally sold in strawberry, green tea and chocolate flavors, which all sound pretty delicious. But a pumpkin cheesecake flavor? It’s definitely a stretch, but we’re sure that the more adventurous pumpkin patch goers might want to give them a try. Though seltzer water has come in an array of fruit-based flavors in the past, pumpkin spice-flavored seltzer water is truly a bold move. After all, many people tend to like seltzer water precisely because it doesn’t taste like anything…you know, just like water. The Polar seltzer brand also released a line of limited edition holiday flavors, including novel flavors like eggnog, candy cane, Granny Smith apple, and of course, pumpkin spice. Some reported that the aroma of the pumpkin spice was actually markedly stronger than the taste itself. All pasta is good pasta, right? We’re not ones to knock the carbohydrate goodness of pasta, but pumpkin spice fettuccine is definitely a noodly stretch. Apparently, the dish is actually rather delicious when it is served with chicken and spiced orange cream. Still, something like pumpkin spice fettuccine comes off as a little strange at first. Okay, now things have definitely gone just a little too far. Isn’t the point of gum to freshen your breath? Even fruit flavors of gum leave a pleasant, refreshing taste in the mouth. Pumpkin-flavored gum, on the other hand, raises some questions. 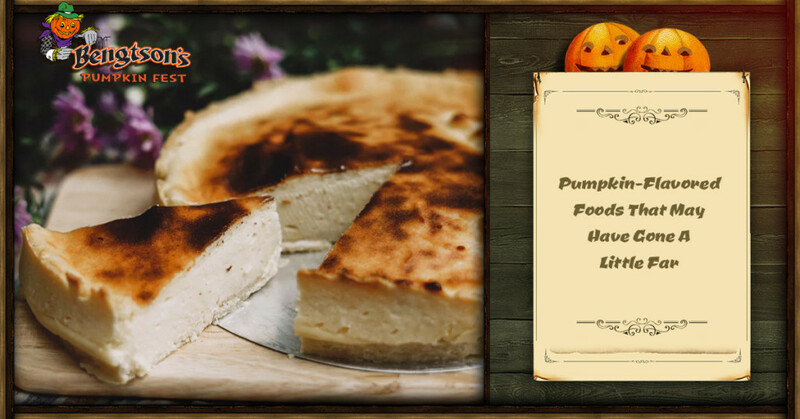 Still, being such dedicated pumpkin lovers as ourselves, we can’t really knock it until we try it. If you’re really going for maximum pumpkin flavor, or pumpkin pie flavor, at that, perhaps sticking to eating an actual pumpkin pie is the best way to go. Once described by the Huffington Post as vodka that “tasted like the horrible medicine your parents made you take when you were a kid,” it’s probably a good idea to steer clear of this interesting alcoholic abomination. If all of you adults out there really want to try it, we’re not going to stop you. Far from the only strange vodka flavor out there, you’ll also find flavors like cookie dough, cotton candy, marshmallow and whipped key lime pie. If you have the brain cells and taste buds to spare then by all means, be our guest. No, it’s not a joke. The madmen over at Pringles actually did it. We’re not judging, but as a salty, potato-based crisp snack, pumpkin pie is not the first ideal flavor that comes to mind. Oh well, they can’t be as bad as the white chocolate peppermint or cinnamon and sugar flavors, right? With Thanksgiving Coming Up, Get Excited For Our Next Pumpkin Patch! Even though the festivities for this year’s local pumpkin fest have come to a close, don’t fret, because next year will be even better than before! Stay tuned for more information about our pumpkin patch farm.